Saving offline maps in Google Maps 2.0 is a sneaky 'easter egg' type feature that'll make Google Maps on iOS even better. You won't need to rely on a data connection, you'll get your maps faster and it'll make things work better. So how do you save offline maps on the iOS version of Google Maps? It's exactly like the Android version. Which means just type in the phrase 'ok maps' (a riff off of Google Glass' OK Glass) into the search bar and search for it. Google Maps will automatically download all the map data that's currently on the screen of your phone. So basically, make sure to zoom Google Maps on iOS to the neighborhood/city/area/county you want to cache before you type in 'ok maps' in the search bar. 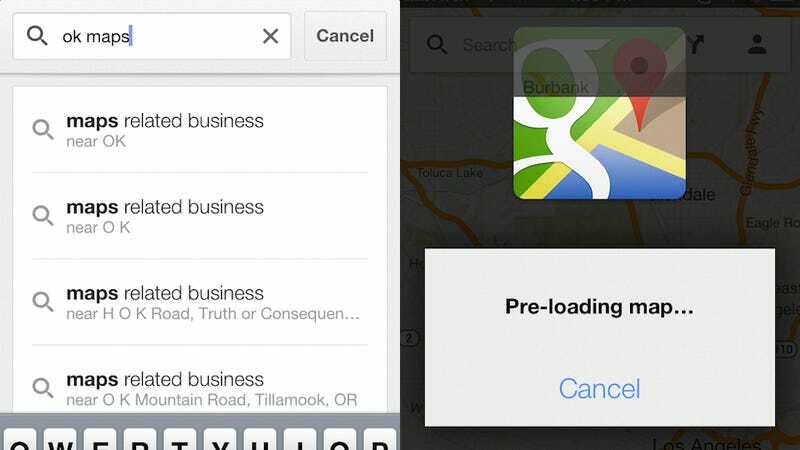 Once you search for it, you'll see a Google Maps icon come up saying it's pre-loading the map. It's super useful if you're in a city with unreliable cell phone service (ahem New York, San Francisco) or if you're traveling abroad.